Android is now covering around 80% of smart-phone market share. Though it's a personal device, friends often take other's phone for curiosity and even sneak through different apps. Before giving back to you, they swipe away all the cards from recent apps history and you would never know what all they did in that time. In this article, we will see how one can check recently opened apps, even if its no longer showing in app history switcher. There is a hidden setting for this. Open dialer on your Android phone and press *#*#4636#*#*. It will take you to a Testing Screen with some list of menus similar to the below one. 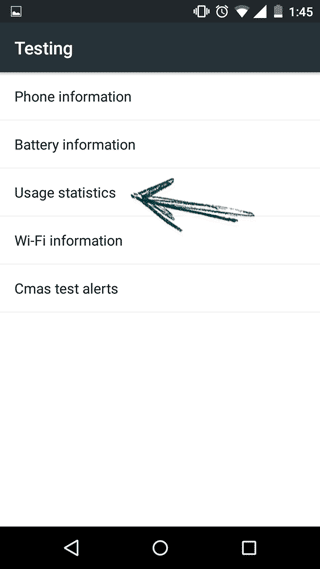 Tap on Usage statistics. 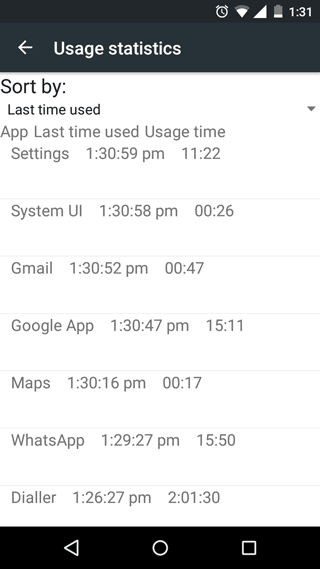 This will take you to a little distorted page with app usage data. Use the drop down on top to select Last time used. And now you can see which all apps were launched at what time. You can ignore some common entries like System UI, Google App etc.